In Stock / 8 SOLD - Order Now! 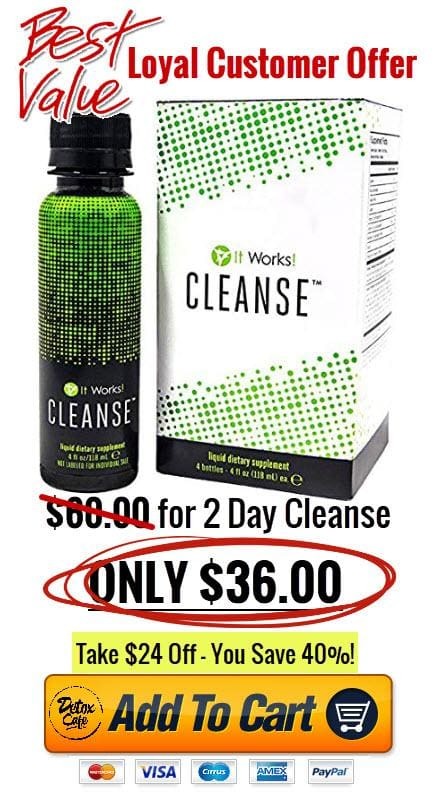 With It Works Cleanse, you can reset your health in just two days! This proprietary blend is packed with 25 natural botanicals, herbs, and greens that are carefully chosen for their cleansing, detoxifying, and supplemental value. The gentle cleanse balances your gut and colon with prebiotic blue agave extract and aloe vera leaf gel. Enjoy noticeable results without any harsh side effects. Try FREE sample before you buy just pay shipping $6.95. This order includes (1) It Works Cleanse. Regular order includes (4) whereby you cleanse with 2 treatments for 2 days.